Refresh and revive hair colour with John Frieda, Shu Uemura and Joico! John Frieda Colour Refreshing Gloss -177 ml - $12.99 - restores vibrancy and tonal dimension between colouring sessions to counteract fading and neutralize colour change, correcting the appearance of dull, washed out colour with a gentle, ammonia and peroxide free non-damaging process that refreshes the tone of colour, regardless of the brand of colour you use at home or at the salon. for warm reds - restores fiery copper tones and counteracts fading for rich, vibrant red colour. Shu Uemura Art of Hair Color Lustre - 200ml - $50 - a silicon-free balm that provides an effective medium to channel a high concentration of micronized pigments to adhere strongly to the hair fiber for colour that lasts up to 5 shampoos. Includes 2 ingredients known for their colour protection virtues: linseed oil - helps provide an evenness of shade revival along the hair fiber; and rose musk oil - rich in fatty acids and anti-oxidants to nourish the hair and help prevent the oxidation and fading of colour. Cool Blonde - refreshes platinum tones and neutralizes unwanted yellows. 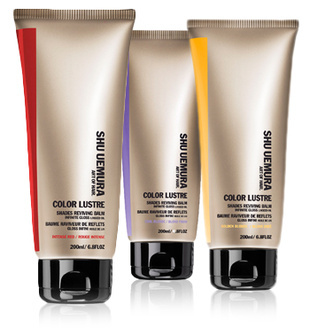 Golden Blonde - refreshes golden tones on coloured or highlighted hair. Intense Red - boosts colour on red hair and accentuates warm burgundy highlights on brown shades. Radiant Chestnut - refreshes caramel tones on chestnut hair and adds warmth and radiance to neutral brown hair. Cool Brown - neutralizes yellow tones on chestnut hair and helps avoid red tones on dark browns. Hair is left with beautiful colour and an ultra-glossy shine - available at participating Shu Uemura Art of Hair salons and online at www.shuuemura.ca. Available in 7 shades: Red, Yellow, Orange, Pink, Indigo, Cobalt Blue and Peacock Green along with a Clear Mixer, that can be used straight from the tube or mixed and matched to create your own custom formula. Each hue can be used with or without the Clear Mixer, for a range of intensities from extreme to moderate to less intense. Ideally applied to pre-lightened hair, results from these highly-pigmentized semi-permanents can last up to 8 shampoos, depending on hair's condition and porosity and it reconstructs as it colors, thanks to Joico's exclusive Quadramine Complex. Hair emerges shiny, healthy and manageable. Available at professional salon suppliers and online at www.canadabeautysupply.ca.